The Rockport Film Review: "Orphan" 2010s Sleeper Horror Hit! 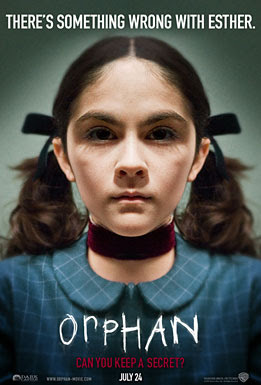 "Orphan" 2010s Sleeper Horror Hit! “Orphan” has to be at the top of the list when it comes to evil kid movies. It’s a rare studio made (Warner Brothers) horror movie that is not a remake or a neutered PG-13 attempt. With quality first-rate actors like Vera Farmiga, Peter Sarsgaard, and the unforgettable Isabella Furhman as Esther, it brings this movie to a higher level. It has one of those big twist endings that you will probably either really love or really hate. I’m on the really love side as I thought it is what made this movie completely crazy and enjoyable. John and Kate are a pretty well to-do couple that lives with their two kids in a house that John designed. Their daughter Max is hearing impaired, while Daniel is your typical older brother. When Kate has a miscarriage they decide to adopt. The fact that Esther comes from an orphanage and does such nasty things aroused a bit of controversy, but with the ending, those claims really don’t hold water. Esther came from Russia to live with her first American family, but tragedy struck as the house burnt down, killing everyone except her. She speaks in a very believable accent and dresses in a peculiar way which gets her teased at school. Like a lot of girls, Esther is a master manipulator who likes to play people against each other and will do anything to get what she wants. The movie also seems to really explore the social dynamics of kids. How they socialize at school, home, and at the park. The acting of the three kids is nothing short of remarkable. Aryana Engineer, who plays Max, was 7-8 years old when filming and is actually hearing impaired. I personally think there is nothing better than to see little kids swearing, as they sprinkle in a few f-bombs here and there. It just gives the story a bit of uneasy edginess that lets the audience know that the filmmakers are not afraid to go there. The violence is also quite raw and brutal. Esther successfully turns John and Kate against each other, when Kate keeps blaming her for a string of “accidents”. John refuses to believe her and that is one of the movie's shortcomings, as it drags on to ridiculous lengths. I won’t give away the ending but I’ll say again that I thought the ending was a fun and surprising jolt that really makes this movie memorable. "Cube" A Brilliant Low Budget Mindbender!